Perennial: existing or continuing in the same way for a long time. 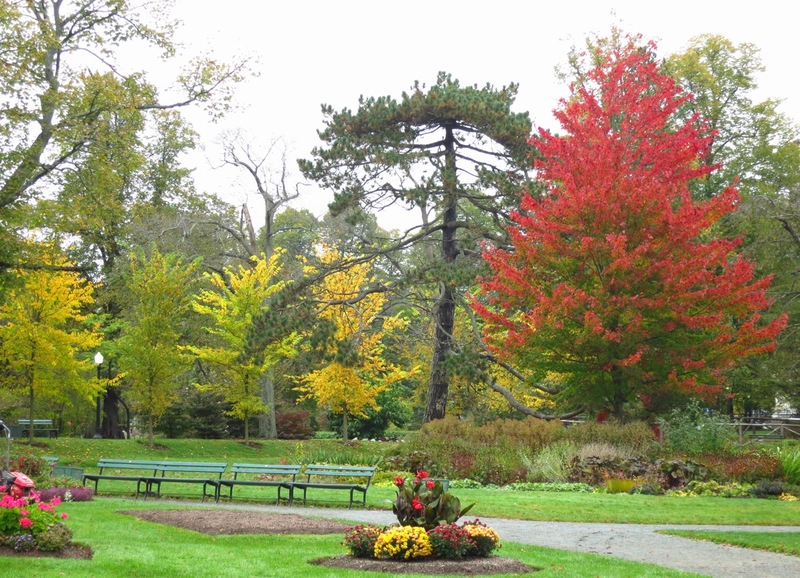 One of the Great Canadian Shows… fall colors. It’s a rites of passage that coincides with the longer nights and cooler temperatures of the fall. Both are the triggers that signal a change in strategy in plants (and humans). We, like them, prepare to tuck in and protect ourselves from the cruel cold. The changing of the leaf colors are a visual representation of the plants process of shedding its vulnerable parts. It does so in order to allow the remainder of the tree to survive the harsh winter environment. The shed leaves fall to the ground were they will break down and provide nutrients to the ecosystem which sustains the tree that grew them. It’s the circle of life. In nature nothing is wasted…and no one can match her when she wants to put on a show. 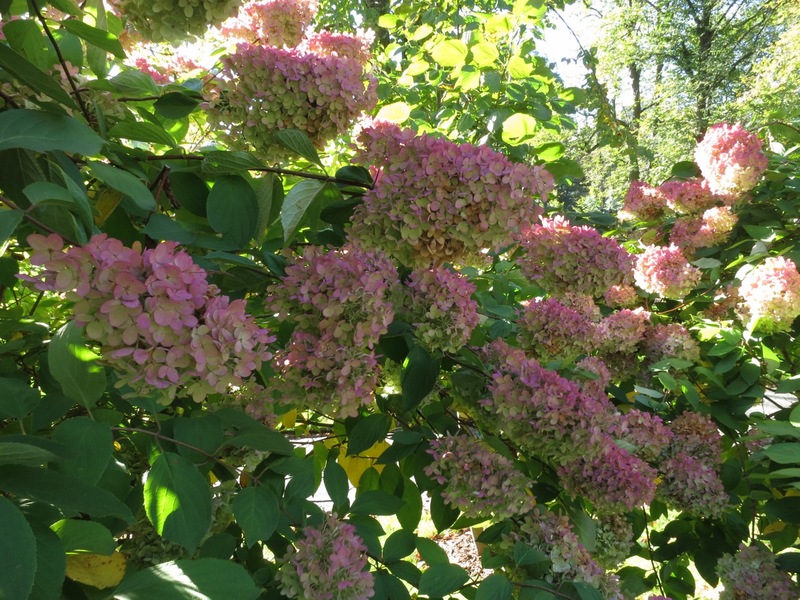 The show began a month ago, with various species of Hydrangea changing the color of their petals. As the temperatures lower and the nights lengthen, the process of photosynthesis (food production) in the leaves of trees slow down, and hormones trigger the tree to ‘seal off’ it’s vulnerable parts. An abscission zone forms at the juncture of the stem and leaf, closing off the flow between the two and trapping the remaining sugars (food produced by photosynthesis) and sometimes waste products. Leaves contain chlorophyll (green pigment) and small amounts of carotenoids (orange and yellow pigments) throughout the growing season. As chlorophyll predominates, green is the color we perceive. When the Chlorophyll ceases to be produced when the abscission zone closes, it disappears from the leaves allowing the yellow and orange pigments to become apparent to the eye. In certain species (Acers /Maples in particular) anthocyanins (red pigment) are produced in autumn. When the chlorophyll disappears, these trees put on a magnificent red display. Leaves that turn brown are showing waste products still trapped in the leaves. 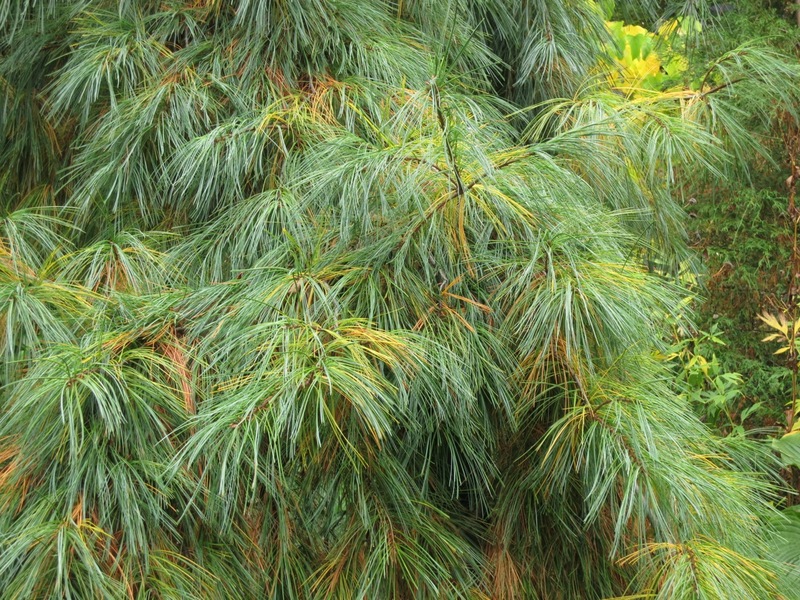 Evergreen leaves have a protective waxy layer and a type of ‘anti-freeze’ in its cells, allowing it to survive the winter. They lose their leaves as well, though not from the yearly ritual experienced by deciduous trees, but from old age. Everything has a shelf life. For the last month of my tours, out-of-town visitors would always tell me that they came hoping to see the changing colors of the leaves.Unfortunately most didn’t see the color show though they never left disappointed. 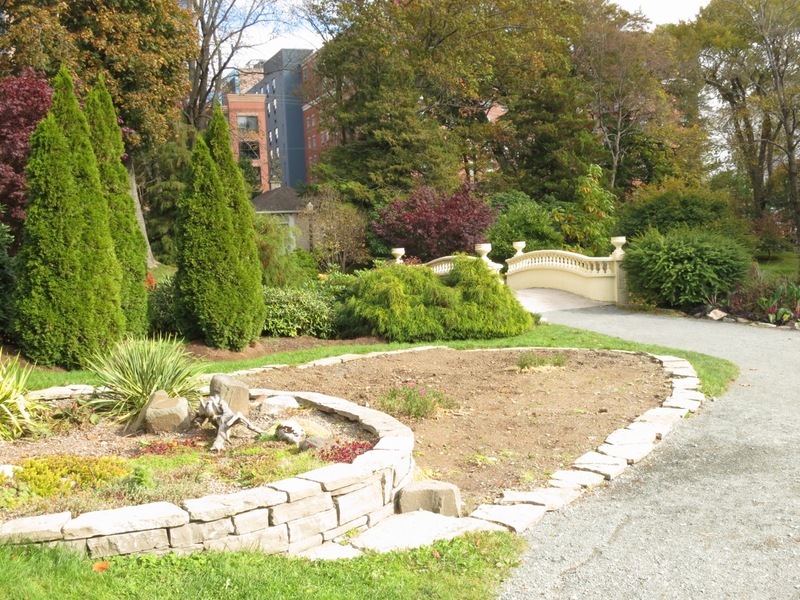 The Gardens deserve its status of being the #1 permanent attraction in Halifax according to tripadvisor. The Agaves and other tender succulents have been moved to the greenhouses for the winter. Frost kills and staff leave so winter preparations have to start early. The temporary (non full-time) gardeners leave this coming week. Their talent and labour will be missed! Have a great winter and we’ll see you in May (presumably you’ll be long back by then). The Dahlias have been taken up to ripen, then the labeled tubers will be stored for the winter to rest until they begin anew in spring. They were still spectacular a week ago but the frost quickly kills them. Better to not let any part go to waste. 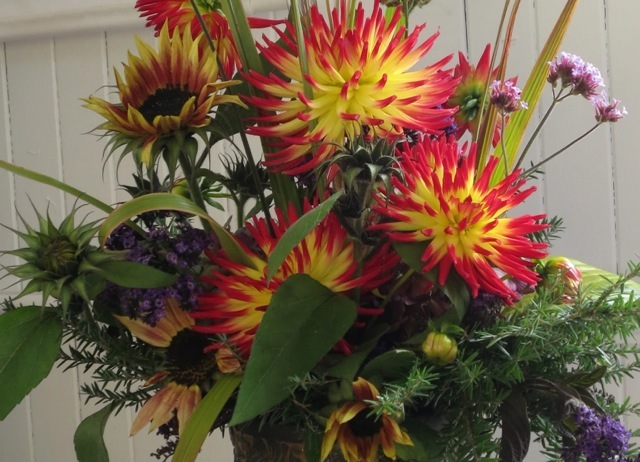 Tracy and Laurie (multi talented gardeners) made 15 gorgeous, unique bouquets with the still-at-their-prime flowers, from the removed Dahlias and other species. 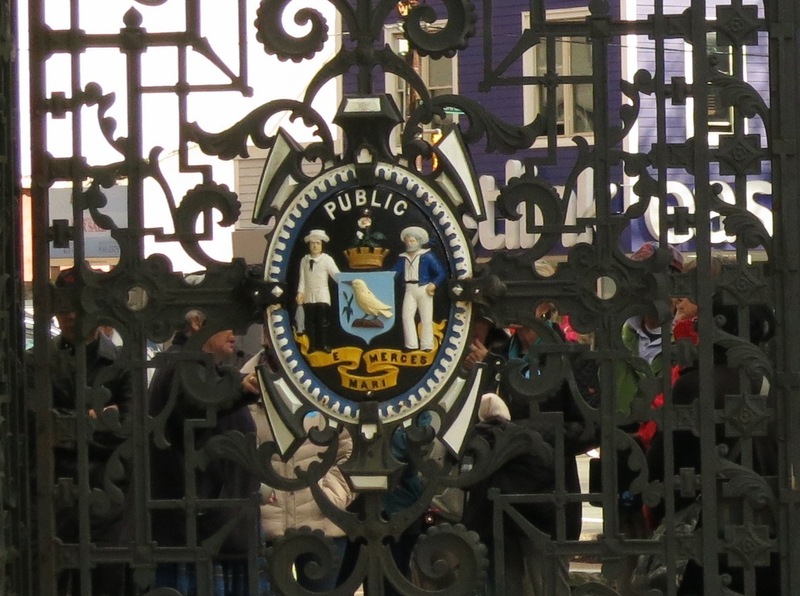 They were delivered to various locations downtown, much to the recipients delight! 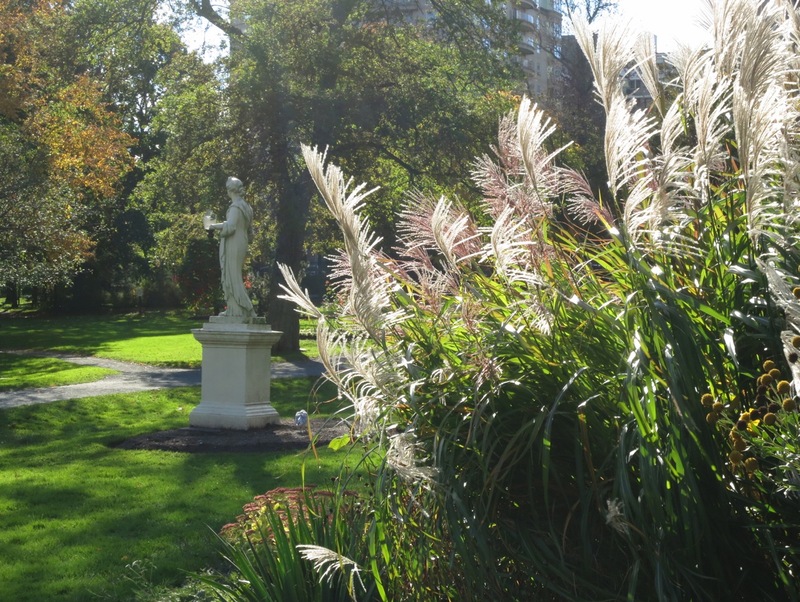 There are still gorgeous vistas at the Gardens. It’s just a matter of adjusting your focus a bit. The migrating ducks, feeding herons and bathing starlings continue to draw a crowd. This naughty duck had a great time enticing the toddler to chase it back and forth, always staying just out of reach. 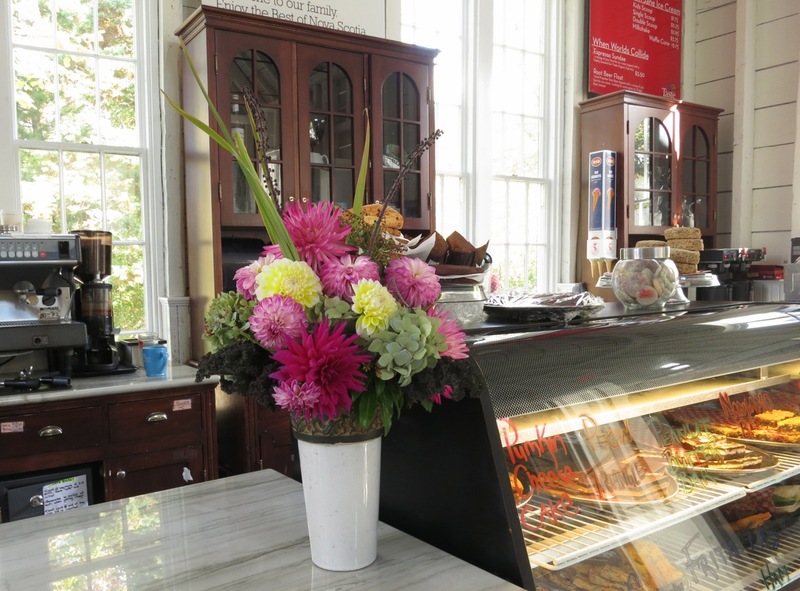 The Uncommon Grounds cafe also prepares for dormancy. It closed yesterday (Sunday, Oct 27), but like all good perennials it will be back next spring. I’ll miss both the place and the staff who so kindly welcomed, nourished and helped patrons, the public and the volunteers. Good winter to all of you and we’ll see you in the spring. As of a couple of days ago the carpet beds, roses, and some geometric beds were still floriferous, but with only a little over a month before the Gardens close for the season, things are winding down. Most of the trees have shed their leaves with some notable exceptions. 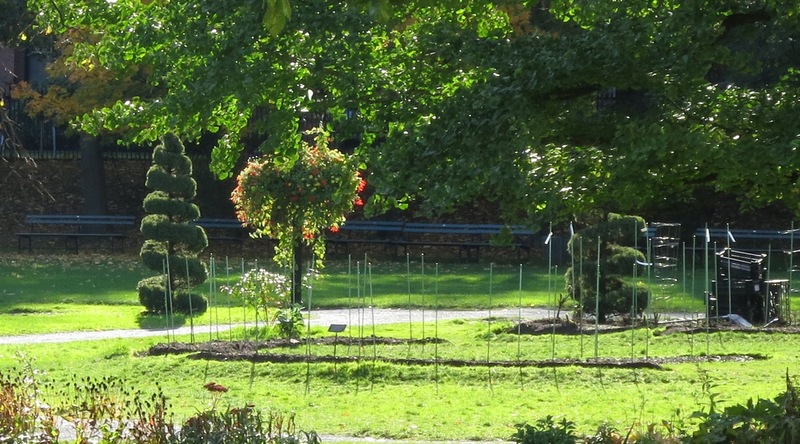 Many of the Acers (Maples) have yet to put on their display. With some huge specimens around, their display will be quite formidable. Enjoy the show while you can. PS: Keep December 5 open and celebrate the Holiday season with us at Hort Hall. All copy and images copyright © Serena Graham-Dwyer, 2013. If you wish to use any part or whole of an image, in any manner, please contact us. 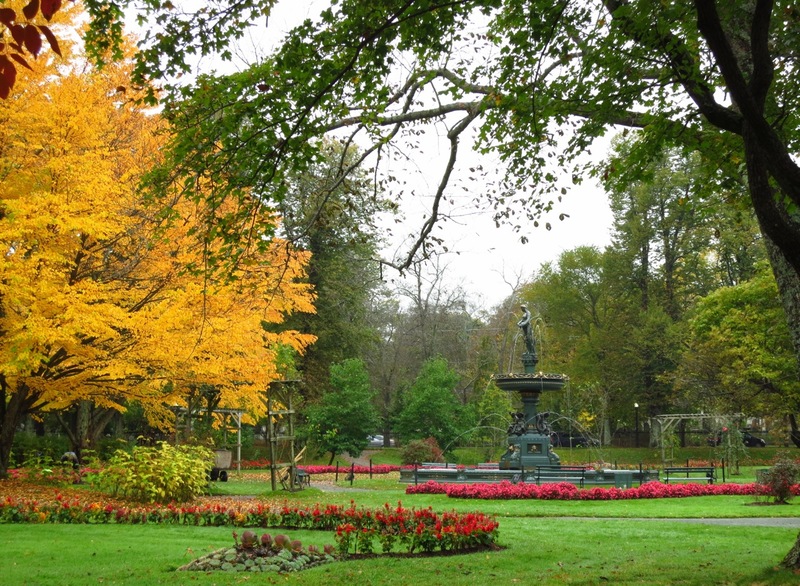 This entry was posted in Fall, Halifax Public Gardens, photo tour, Trees and tagged carpet beds, dahlia, Fall colors, Halifax City motto, Halifax public gardens, Jubilee fountain, katsura tree, Main gates at the Public Gardens, serpentine beds, uncommon grounds by friendsblog5665. Bookmark the permalink.